History: 14 year old boy with lump in scrotum. 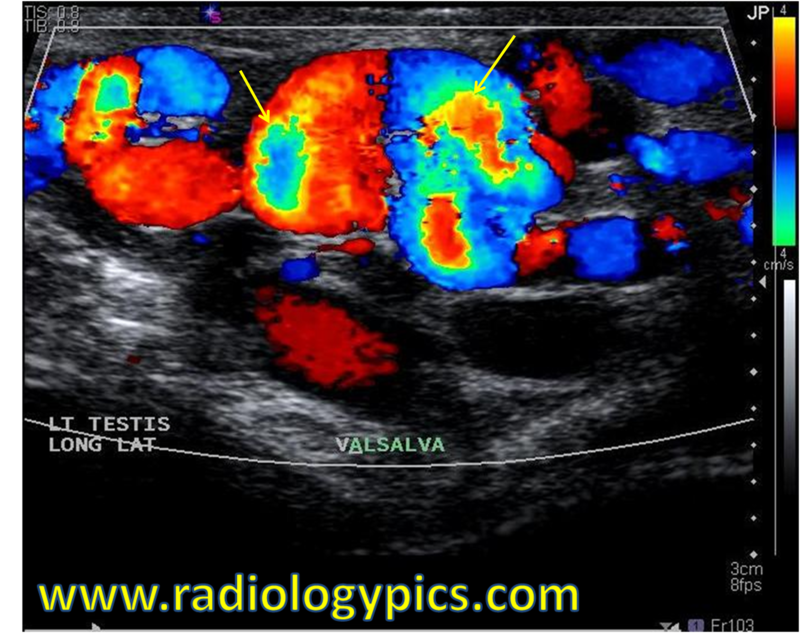 Varicocele without valsalva: Doppler color ultrasound through the left scrotum shows multiple dilated vascular structures. 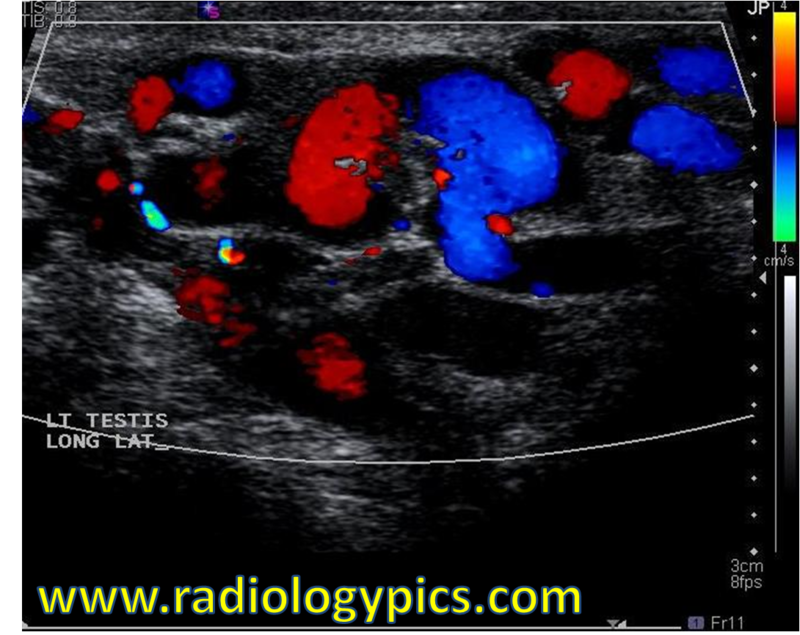 Varicocele with valsalva and aliasing: Doppler color ultrasound through the left scrotum in the same region as the first image above reveals increased flow and dilation of the vessels as the patient performs a valsalva maneuver. Note the regions of aliasing indicated by the yellow arrows, which indicates high flow over the 4 cm/s scale selected by the sonographer (as seen in the color scale on the top right of the image). This is a case of a varicocele. A varicocele is dilation of the pampiniform plexus of veins due to retrograde flow in the internal spermatic vein. It is diagnosed most frequently by ultrasound criteria of vessels dilated to 2-3 mm or more. Varicoceles are seen about 80% of the time on the left side (as the left gonadal vein drains into the left renal vein), 5% of the time on the right side, and 15% of the time bilaterally. Performing valslava just accentuates the flow through the varicocele and allows definitive diagnosis. In the image above, this increased flow causes aliasing, which is a form of “wrap around” artifact seen in ultrasound. On doppler color ultrasound, aliasing can be determined when the border between the red and blue colors is yellow and green, indicating the velocity of the flow has increased through the postive red to yellow scale and back up the bottom of the scale through the green color and on to blue. Reversal of flow from red to blue or vice versa will always be bordered by a black line, indicating that flow went negatively from red through the “zero flow” (black color) and to blue, as opposed to wrapping around to the green color. The main differential diagnosis in this case is tubular ectasia.